Latin ~ One of the foundations of a Classical Education. Sounds scary, doesn't it? And yet it is one of my favorite subjects. Yes, I realize we are learning very elementary Latin, but we are LEARNING LATIN. Even Leif has memorized full prayers in Latin. Are you curious as to why students should learn Latin? Read here. Or why teach Latin to elementary students? Read here. Luke sum ipse patrem te. Aspice, officio fungeris sine spe honoris amplioris. We're learning it this year too! I looked at Prima Latina and was a little intimidated, in part because I had a 3 year old son (now 4) who would be right there with us. I went with Song School Latin and we all love it, especially my younger boy. 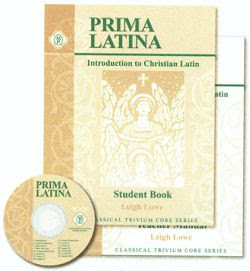 I will be using Prima Latina in the fall (because now I'm not intimidated!). We listen and practice at the dinner table. So much fun. This is a great post Heidi! Goodum Luckum!